Author’s note: This is the third installment of a three-part series of articles. J.I. “That hill is never coming down!” This phrase was uttered to me a couple of years ago by a lifelong resident of Smithfield while speaking about Wolf Hill, a topographical land mass that geographically divides the town, with the villages of Esmond, Georgiaville, and Stillwater, to the east, and Greenville, and Spragueville, to the west. However the man wasn’t speaking about geography, he was talking about politics, for he was recalling a time when an “us verses them” situation existed between one side of the “hill” and the other. Some might say it still exists, but few realize just how close the rift came to actually tearing the town apart in the early 1920s. Prior to World War II, Smithfield was still a rural community dotted by five villages, which existed primarily because of the textile mills. It was a time when the separation between villages was obvious, and each village was its own community. People took pride in where they lived. They were active in village affairs, played sports on mill sponsored teams, joined clubs, served on church committees, and volunteer fire departments. Even today there are those who will name a village rather than say “Smithfield” when asked where they reside. It is therefore understandable that everyone wanted what was best for their village, but this led to rivalry when some felt that that one side of town was being favored over the other. Many claim that social status fueled the fire, for Greenville has always been considered to be the wealthier side of town. However, it should not be overlooked that wealthy people did, and do, live elsewhere in town besides Greenville. Others cite politics as the cause, claiming Greenville was predominantly Republican, while Georgiaville and Esmond favored the Democrat point of view. This may or may not have been true, but social class and politics have always been divisional forces. Another point of contention was the location of Smithfield’s unofficial Town Hall – Oscar Tobey’s general store in Greenville.A town hall is the seat of government, and the base of power; where important decisions are made, and where records of those decisions are kept. Prior to the division of the town in 1871, Smithfield’s Town Hall had been located in Central Falls, but afterwards it was more or less decided that town records and town business would be administered out of Tobey’s store since Oscar Tobey had been elected Town Clerk. A hall above the store provided space for town meetings. In this way, Tobey’s store became the unofficial Town Hall of Smithfield, and the decision did not sit well with some. One complaint was the inconvenience of having to travel from one side of town to another if one needed to conduct town related business, pay taxes, or attend council meetings. In a day before automobiles, this was a valid concern. A compromise was reached when it was agreed to alternate town meetings from one side of town to the other. However, meeting locations in Georgiaville varied between schools, churches, and even private homes, depending on expected turnout. Therefore, some still advocated for a permanent town hall that could be situated in a more centralized location, but others maintained that things were working just fine the way they were, and pointed out that building a new town hall meant spending money which might translate into higher taxes. realization that Smithfield did indeed require a Town Hall became a generally accepted idea. 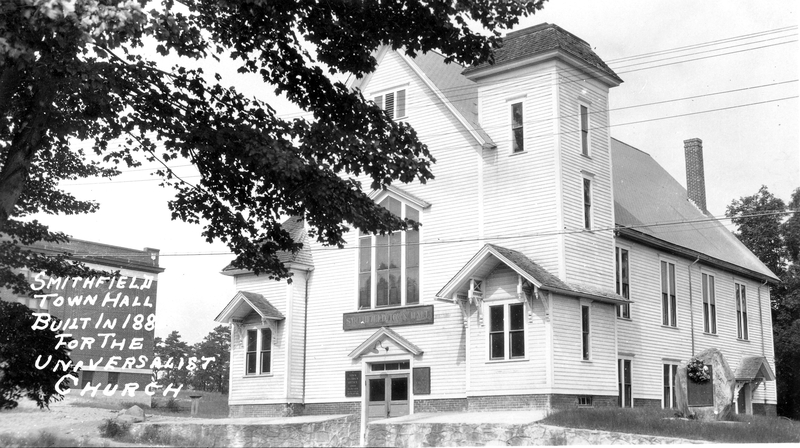 Unfortunately, cost was still an issue, and the debate over where and what to build continued until the summer of 1920 when it was proposed that the town should buy the old Universalist Church in Georgiaville (What is today the V.F.W. Post on Farnum Pike.) and convert it to a multi-use, town building, which would include a permanent Town Hall. Purchase of the old church by the town made sense, for it was far less expensive to repair an old building than to buy land and build new. However the deal was not looked upon favorably by many residents of Greenville who saw it as breaking with tradition, and shifting political power. Greenville, they maintained, had been the seat of town government for nearly fifty years, and many wanted it to remain “Smithfield’s capitol”. Despite any protests, the voters approved the purchase, and shortly afterwards needed renovations and repairs were begun. The Universalist Church dated to 1888, but in recent years had fallen into disuse. Besides a fresh coat of paint and some needed carpentry work, a jail cell and a vault were constructed. The vault was to keep town records; the cell was to hold prisoners waiting to be arraigned in the Ninth District courtroom that was constructed upstairs. Court was in session every Thursday, but when not in use, the room served as a meeting hall for the Town Council, and other organizations. Greenville had lost the battle, but the war continued. Someone, (Presumably from Greenville. ), started a grass roots effort to separate Greenville and Spragueville from the rest of the town; in effect, secede from Smithfield and form a new town!The proposed new boundary line would run generally north to south right across the top of Wolf Hill. Evidently enough people felt strongly enough about seceding that the issue was placed on the ballot in November of 1922. Town Council Journal #6, Page 106, records a special meeting that took place in Greenville on October 26, 1922, where the subject of dividing the town was discussed. Part of the minutes read, “Voted, that the Town Clerk be and he hereby is directed to insert in the warrant for the forthcoming election, and place upon the ballots the question of dividing the present Town of Smithfield – “Shall this town be divided into two separate towns along the approximate lines of the present voting districts?”. It was likely a very heated election season that year, for not only did the measure get defeated, but the entire incumbent Town Council was ousted. As to the dividing the town, 179 voted in favor, and 481 voted against. It’s interesting to note is that of those who voted to divide the town, 87 were from District 1, (The Greenville side. ), but 92 were from District 2, the Georgiaville and Esmond side! Once the matter had been settled, preparations were begun to transfer town records from Greenville to Georgiaville. When the transfer was complete, a Providence Journal headline from November 11, 1923, declared, “Georgiaville Elated Over Defeat Of Ancient Rival”. History shows that In the long run moving the town hall was a good thing, for the old general store where town records had been kept since 1871 was destroyed by fire just two months later in January of 1924. The old church served as Smithfield’s Town Hall, for many years afterwards, but by the late 1930s the building had become too small for the needs of the town. A committee was formed to find a new site, but the country was now in the midst of the Great Depression and money was scarce. Had it not been for federal funding from the Public Works Administration the project would not have been economically feasible. Several locations were considered, and some rallied for one in Greenville, but it was not to be. Once ground was broken for the site of the present Town Hall in 1939, it established once and for all Georgaiville’s place as the seat of town government.